Capabilities and Taxonomies for Calendarize it! | Calendarize It! Capabilities and Taxonomies for Calendarize it! 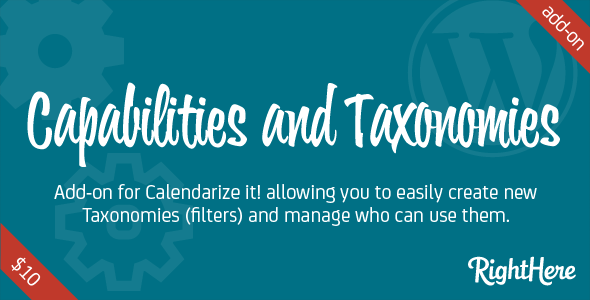 Capabilities and Taxonomies add-on for Calendarize it! allow you to easily create new Taxonomies (filters) and manage who can use them. You will be able to set which user roles that can manage, edit, delete and assign (use) Taxonomies. This will give you complete control, and you can avoid that users will delete any of the filters you have assigned to the events. How to download free add-ons and purchase premium add-ons? Enter your License Key in the Options Panel of Calendarize it! and get access to the Downloads section where you can download free add-ons and purchase premium add-ons. When you have entered your license key click on Downloads in the menu and you will now be able to download the free add-ons as well as purchase the premium add-ons. By default Calendarize It! has three built in Taxonomies (filters), which are “Calendar”, “Organizers” and “Venues”. For some customers these doesn’t work. You can disable the default custom taxonomies in the Options Panel of Calendarize it! And with the premium add-on Capabilities and Taxonomies for Calendarize it! you can then create your own custom Taxonomies (filters), and you can even control who can manage, edit, delete and assign them to events. This is set by User Role. After creating your custom Taxonomies (filters) you can easily set who can manage, edit, delete and assign the Taxonomy. Bug Fixed: When using apostrophy in the Taxonomy name it renders with \ instead of aphostrophy. New Feature: Added HTML description to the layout metabox so that the Custom Taxonomy description can be added to the Details Box. Update: Change the layout so that it matches the Visual CSS Editor default styling for Event Grid View. New Feature: Added shortcodes for creating Venue List and Organizer list (taxonomies). Update: Added the taxonomy slug to the label, to make it possible to identify taxonomies that have the same label but are different for post types.